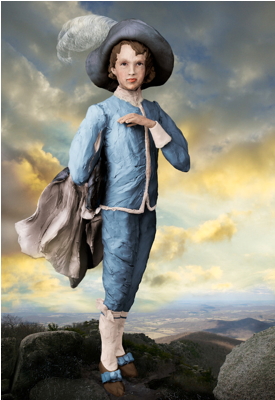 Suellen Parker, Blue Boy, archival inkjet print, 58"x40"
Please join us Friday, October 19th for the opening of reception of Letting Go by Suellen Parker, her first solo exhibition in Atlanta. The show investigates how an individual can find his or her own voice despite the ideals and gender roles foisted on us by society. Parker’s characters look within themselves to find out who they are, letting go of cultural standards and expectations. Instead of limiting themselves to prescribed genders, Suellen Parker’s characters open up to a more authentic expression of self by exploring aspects of both masculine and feminine attributes. This exploration allows for freedom of expression, creativity and individuality. By engaging in private play, they are able to let go of expectations and rules. The result is a personal and truthful moment that they enjoy without fear of judgment or consequences. Suellen Parker has shown her work all over the world. Her photo illustrations have been featured in several notable publications, including Discover Magazine, The Atlanta Journal-Constitution and on the cover of The New York Times Magazine. Her can be seen in the permanent collections of Sir Elton John, Musée de l’Elysée in Switzerland, Tel Aviv Museum in Israel and the Savannah College of Art and Design in Lacoste, France. This entry was posted in Uncategorized on October 17, 2012 by Whitespace.